OK how different is this for me? I longingly look at the LiM cards people make and wish I could do that and yes this is fairly LiM but it took me ages, and I mean AGES to make. The panel is made with PanPastels blended for the background, a stamp by Oxford Impressions, some music paper, sentiment and baker's twine. This is perfect for my husband for Father's Day, I hope he likes it. I am looking forward to seeing the entries at PanPastel UK this week and there is a generous prize of a PP set from Your Creativity Store. I hope you have been having a good weekend - enjoy Sunday. It IS hard to start creating Clean And Simple cards isn't it? 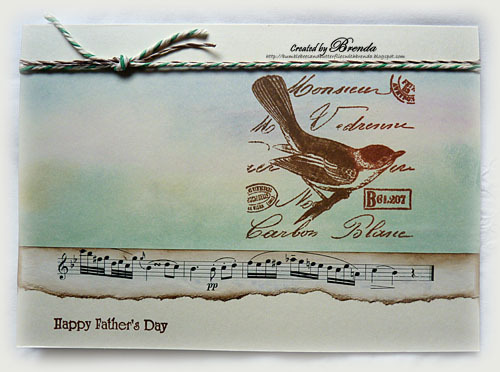 Wonderful colouring and stamping Brenda - the distressed strip of sheet music is a stroke of genius. A totally beautiful card. I sometimes think the LIM stands for less on the card - more work. I find it hard to do the simple look - tend to be a throw everything at it kind of girl. Love this one and the blended pastels look great. I bought some but don't think they 'like' me. Delightful card, Brenda. Simple and sweet. gorgeous, those colors are subliem! Hi Brenda, A fabulous LIM card. I know what you mean about being hard to make, its so much easier to 'add'!! Those scare me, Brenda, as do ATC's! Whatever amount of time and effort you put forth in this LIM card, worked and worked beautifully! The subtle colors is perfect for a Father's Day card and I am sure your DH will so love it. Make sure you let him know it took you hours, so he is making dinner! Hugs! Thank you for the kind words and support you have left on my blog ... means a lot. Hi Brenda...the simplicity looks so delicate and so very well balanced. Great colours and the thoughtful details are perfect! I love it!!! A beautiful card, great image. I know what you mean.... LIM cards are really hard to create, for me, too. This is gorgeous! I have that beautiful set of stamps myself. I am in agreement, LIM style cards are ones I struggle with and see as a challenge - you say this took you an age but you make it look all so effortless. I had to lol at your comment on my blog. I guess I haven't been very well organised as I have a heap of projects to share, in particular for Crafty Individuals. Have a wonderful week and thank you always for your support. I had to laugh at your post. I agree Cas cards are tricky and usually take me forever. Nowhere to hide the mistakes. This is so Pretty Brenda and a little different than your other work. Non the less it is stunningly beauty, the soft colours and stamping are just perfect. This is fabulous Brenda. 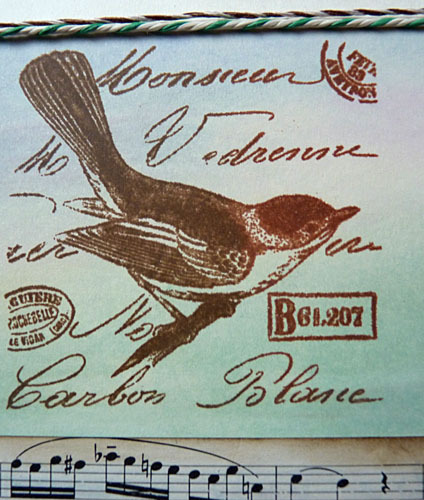 Love the bird and the inky effects and the torn music score looks perfect. I know what you mean about LIM as I can't do it! Sorry to leave commenting so late - not enough hours in the day lately! How beautiful, Brenda! I'm sure he will love it. That torn music edge is a wonderful addition and I love the way you've used the pan pastels. Your husband will surely love this wonderful card....gorgeous birdie! This is gorgeous! Men seem to like LIM, so Ken will love it, but I am a MIM girl myself! Just struggled to make an anniversary card for Col without going over the top! Fabulous Father's Day card! 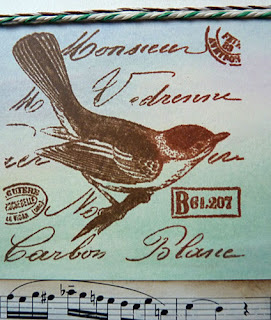 I have that bird stamp too and just love it!